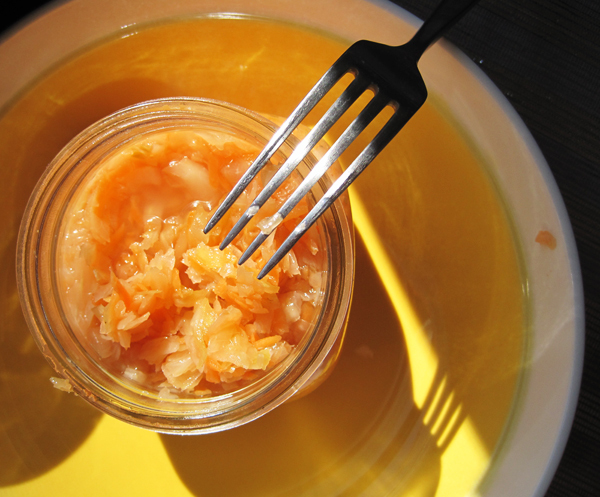 Regan has been making sauerkraut lately. The reports of it as a digestive aid and immune builder outweighed the years of him being nauseated by the smell of it that he associates with childhood. Every few weeks he’ll chop up a cabbage with some carrots, lightly salt and place in a Ball jar, letting it sit to slowly ferment. He’ll eat a fork full with a meal each day and he’s still standing. So, I may or may not attempt making yogurt again but I’m still really fascinated with the process of food fermentation and aging. Even though I know essentially where food comes from I still have a disconnect from how it’s truly made, though I’m working to understand it all. I’ll probably never be one to attempt aging meats or cheeses because of my already poor track record with making nausea-inducing yogurt, but who knows? I feel like making some sour dough starter might be a safe project to get me out of my failure with fermentation so far. I’ll let you know how it goes. What have your successes or failures in fermentation been? Yeah he did. Every nauseating bite of it. This book demystified fermentation for us. So I’ll be reading the entire Amazon sample tonight and will probably follow-up with buying the book. This book had me at the foreword. Thanks for the recommendation, Isaac. I’ve had decent success with beer, does that count? I’ve always wanted to try doing beef jerky. Alton Brown did an episode about it on Good Eats once. Totally counts. And I can confirm your success with beer is better than decent. If you do beef jerky please let me know. We’ve tried it, but with mixed results. There’s no proof that it was the yogurt!